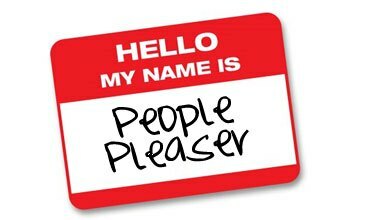 Are you a people pleaser by nature? I have to pray daily that the Lord would help me to seek Him first, above all else. I cannot please everyone all the time anyway! Why bother trying? I love this quote: "I know full well that the world will never see me the way God does, and I've stopped caring." I can quote it...but do I really mean it? I think about all of the horrific examples in the Bible of people who craved the approval of man over the approval of God. For instance, King Uzziah was very successful (2 Chronicles 26:5) as long as he sought the Lord. God gave him success because he desired God's will above all else. But then pride got in the way and he began to seek the approval of others. King U wanted to be in control. He wanted everyone to like him and he wanted the power that comes when people think you are "the man". He went into the temple where God specifically said only the priests were allowed to burn incense and insisted on doing it himself. He wanted to be in control of everything and have everyone respect him. He craved man's approval over God's, burned the incense anyway and immediately broke out in leprosy. He died, alone, outside of the kingdom completely separated from the people. What a tragic end to a story that started out so well! These are just a few of the consequences, but I know there are more, unfortunately. Do you realize that when you try to please a person over God, seek their approval or you take their "opinion" of you above God's, that you are actually putting them in the place of God in your life? This is called "idolatry" and it breaks the first two commandments. Nobody should have that power over you in your life but God. Nobody. Eventually, you will disappoint others because of unrealistic expectations that they will put on you. Don't be a slave to this! You cannot win, it is impossible. Break free! 1. Recognize that there is a big difference between "doing good" and "people pleasing". 2. Set priorities and protect them with your decisions. For instance, practice saying "No" when someone asks you to do something cuts into your family time or quiet time with God. There are kind ways to do this, and people respect when you protect your priorities, whether they like it or not. 3. Recognize that you will never be able to please everyone, all the time. You will be exhausted if you continue to live your life for others. There's a difference between serving someone out of love and serving someone out of manipulation or expectation. Seek the Spirit in knowing the difference. 4. Learn to be okay with "negativity". Sometimes, when we don't live up to the expectations people put on us, we have to deal with their opinions, their dis-satisfaction or their negativity. That's okay. Your peace of mind is what matters. Eventually, they should get over it and understand your perspective. If not, this could be a way that God uses to pry the negative person out of your life for a season (or for good). Man's rejection is God's protection! 5. Give yourself grace. One big thing that people pleasers usually do is judge themselves harshly, which will fuel the fire to try to get approval from others. Learn to love yourself - right where you are. Give yourself grace when you mess up! 6. PRAY! Pray that God will reveal the reasons you tend to want to please others. How did you become a people pleaser in the first place? Why are you so afraid to disappoint others? What is it that you get from pleasing others that keeps you in the vicious cycle of doing it? How can you live to please God alone? Let's realize that God's thoughts of us are pure, lovely, admirable, true, and holy. He will never turn His back on us, He will not put conditions on His love for us and even when we are not faithful, He will still be faithful to us! (2 Timothy 2:13). God knows full well that we will never be able to live up to perfection and He will never put unrealistic expectations on us. He knows we cannot possibly do it...that's why He wants to do it Himself, through us. When we allow Him to be first in our lives, when we seek His approval instead of others' approval, we find peace.